Staffing firm Randstad has identified 6 new trends that will impact employers in the coming year. As 2017 comes to a close and the talent landscape continues to evolve, Randstad US released its expert analysis on hiring and workplace trends for the next year. With employment increasing by an average of 167,000 jobs per month, according to the Bureau of Labor Statistics, the labor market remains competitive, and employers will need new strategies to attract top talent and meet business demands. The talent shortage will outpace wage stagnation. Many businesses have not yet updated their pay packages to reflect market realities, especially for hard-to-find talent. Hiring managers must weigh the importance of the quality of a candidate against the cost to recruit them, and companies that continue to keep wages below market will struggle. This will also drive employers to more broadly offer non-traditional benefits, such as wellness perks and competitive maternity and paternity leave. Agile and flexible workforce models will expand. There’s a shift underway in the long-held perception that in order to attract the best candidates and build the best team, organizations must hire full-time, permanent employees. Sixty-one percent of workers expect to choose agile work opportunities by 2019. Research shows that candidates don’t just want, but expect the option to work from home, work part-time or have access to flexible scheduling. Flexible work arrangements will remain key to employee attraction and retention, and companies will expand their use of agile talent by filling one-time temporary resources and seasonal staffing needs or bringing in highly-specialized consultants to tackle critical initiatives. Employers will hire for culture and soft skills, train on hard skills. With a depleted candidate pool, employers are struggling more than ever to identify right-fit candidates with the depth of necessary skills. While hard skills reign in sectors like technology and healthcare, less-teachable soft skills will continue to be critically important — even in a more technology-driven work environment. Employers will increasingly focus on training existing or future hires, especially when they find the culture fit they are looking for or superb soft skills. STEM skill needs will continue to increase. Although much of the industry discourse around the STEM skills gap focuses on jobs that require advanced degrees, mid-level STEM jobs like computer support specialists, web developers and engineering technicians are actually in highest demand. These vacancies present a real opportunity for employers to upskill workers with high potential and the ambition to grow. AI and automation will advance. Many organizations have already begun incorporating automation into their workflows to make their employees and processes more effective and efficient. But, despite fears that automation will eliminate jobs, the need for skilled humans to operate, use and advance technologies will remain significant for the foreseeable future. Talent analytics will become more sophisticated. Data is evolving beyond metrics like employee engagement and retention rates. In 2018, more organizations will place data at the forefront of strategic workforce planning, with metrics that help them understand how to build better teams, make more processes agile or lean, analyze the utilization of resources across the company and truly understand the output of cross-functional teams. In 2018, business leaders will need to adapt and evolve alongside these changes, as they remain the link between talent and corporate profitability. 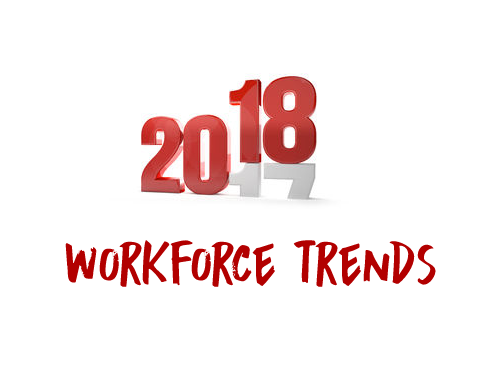 To view more takeaways from Randstad’s featured executives, check out these six workforce trends that will dominate 2018.